Are you interested in learning more about Art Licensing so you can decide if this path might work for you? “How To Get Started in Art Licensing – Second Edition” is an introduction to the realities, nuances, processes and procedures of licensing your art. This isn’t a “pie in the sky . . . you can make money in your sleep” type of book. It is an honest and straightforward look at how art licensing works so you can decide if direction might be for you. Does a flexible lifestyle appeal to you; one where you can create when and where you are inspired? Have you tried finding a gallery to carry your work? Have you spent days sitting at art or craft fairs, at the mercy of the weather and people who decide to show up? Do you want to get your art off the paper and onto products? Would you love to walk into a store and see your art on greeting cards, coasters, stationery products, dishes, or any other products? The goal of this eBook is to SAVE YOU time, money & frustration. The information in this book has been derived from personal learning and hands on experience in the art licensing industry – from the artist’s perspective, the manufacturer’s perspective and the agency perspective. You can learn how to earn a living from your art, on your terms, by licensing it to manufacturers to use on products. For only $67 you can learn the basics and decide if art licensing is right for you. This digital book can be yours immediately – simply download and enjoy on your computer, iPad, Kindle and more . . . anything that can read a pdf. • Have never heard of Art Licensing and want to learn more. • Have heard of Licensing, but don’t quite understand it. • Have started, but want help building their business. Each artist comes to licensing from a different background and takes a different path. Learning from several resources is a great way to discover what will work for you. Give you the basics of what Art Licensing is so you can decide if it is the way you want to make a living while doing what you love. Help you decide if art licensing is a good fit for you – do your art and your goals work with what is needed to succeed in licensing? If so, you will have flexibility of setting your own work day and be able to “visit” art when it appears on product in stores near you. Teach you the basic things to think about when you get started. Save time, and headaches by organizing the business side of your art from the beginning. Let us help you shorten your learning curve. The first in a series of eBooks, “How To Get Started in Art Licensing,” gives a basic overview of the industry, how licensing works and what you need to consider to start and run a successful business. Part 1. What is Art Licensing? Learn what it means to license your art and decide if it is for you. Learn the types of art that are regularly licensed to help you decide what and how to create. Read the stories of licensed artists to better understand the many ways of going about licensing. Think about your style and vision so that you don’t waste your time and efforts going in too many directions at once. Understanding who is licensing art, how to find them and what they are looking for will put you that much closer to signing your first deal. An interview with an art print publisher gives valuable insight and advice for artists getting started or building their business. Discover what agents do and don’t do, and how to go about finding one if you think this is the best fit for your business. An interview with an agent will give you insights into what an agent expects from you as an artist so you can present yourself in a way that will increase your chances of being picked up. Terminology and Contract basics will help you feel more confident when you begin talking with manufacturers. Avoiding basic business pitfalls that can cost you money later. Start branding yourself from day one to create a presence in the marketplace. Learn how a website can help you build your business faster. Save money by learning how to get free publicity. Trade show basics to save you time and money. Laura Bray of Katydid-Designs, com, an “artist with an MBA,” shares how to use eZine newsletters to stay in touch with clients, potential clients and fans of your work. The internet is not a fad so learning to use inexpensive tools to keep your name and artwork on people’s mind is worth the time! Or preview Part 1. “What is Art Licensing?” for FREE. Take advantage of this opportunity to try before you buy! To get started, fill out the form below, then check your email! 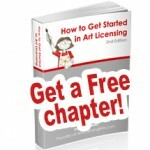 Thanks for writing your e-book, How To Get Started in Art Licensing. What I liked best about it was that it got right to all the main, meaty points, without fluff. I like that I got all my basic questions answered without having to skim through pages and pages of impertinent information. I also like that I can print it out and highlight sentences that will remind me of the steps I need to take next. I’ve read your book and I feel empowered and ready to get started. Thanks! So well done on putting together such a comprehensive guide for us greenies! I read the whole eBook (How to Get Started in Art Licensing) in one sitting even when I was actually so sleepy and tired from work. I was so encouraged and now more informed because prior to reading your book, I never really thought of art licensing or even surface design! I’m now in the process of brain storming for the branding part. Just a quick note to say thanks for your wonderful e-book “How to Get Started in Art Licensing”! It’s given me the jump start i need to organize and begin rolling out what i can do to get my pattern designs in front of potential clients/manufacturers. I am excited about the multitude of opportunities out there and deeply thank you for the step-by-step guidance you’ve provided in your e-book.